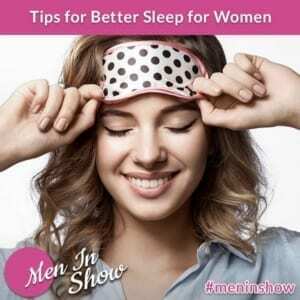 When you have a relaxing bedroom to sleep in, women’s sleep is much more restful. With this in mind, here are some ways you can set yourself up for success. Maintain a schedule. It’s important to get up and go to bed at the same time every day – even on weekends. Your brain needs a schedule so it can be prepared. Seek out sunlight. Open your curtains when you wake up and get outside when possible. This will help your body know when to be awake and when to be asleep. Get plenty of exercise. According to the National Sleep Foundation you should get 150 minutes of moderate or 75 minutes of vigorous aerobic exercise per week (e.g. running, brisk walking, cycling). Avoid caffeine and alcohol. This is especially true at night. Make sure you have your coffee at least 5 hours before bedtime. Alcohol is also bad because it increases the adenosine in your body but once it leaves your system, you’re jolted awake again. This will disrupt your restorative REM sleep. Create the right temperature – between 60 – 68 °F. Any hotter and you’ll find yourself sweating, which will majorly disturb your sleep. Any cooler and you’ll be shivering, which will wake you up. Put up blackout curtains. Even a small amount of light from any source will affect your sleep. Turn on some white noise. Either a white noise machine or a fan will lull you to sleep because their “whir” is relaxing. A fan has the added benefit of keeping you cool throughout the night. Clean your pillow and mattress protector. Allergens make their home there then they make it difficult for you to breathe and sleep well. Get a firm mattress. This is especially important if you have back problems. Lock your pets out of your bedroom. Unless your furry friend helps you sleep, they should stay out of your bed. Their movements and noises could wake you up otherwise. Turn off the LED lights and electronics. It’s a good idea to do this two hours before going to bed so your brain has time to wind down. If you can, use an incandescent lightbulb in your bedside lamp and don’t fall asleep with the TV on. Even the light your charger emits can negatively impact women’s sleep so unplug or cover it up. When you try all these things for a great night of women’s sleep and it still fails, don’t lie in bed staring at the ceiling. Get up until you feel sleepy. If you’re feeling anxious, try journaling. Sometimes you may need to talk to your doctor if the problem persists. They may suggest you try cognitive-behavioral therapy for insomnia (CBT-I) or take a prescription sleep medication like about 4% of American adults must do.